From goodreads: My life has always been safe. I like it that way. I grew up in a fake society where plastic hearts rule. If our hearts are made of plastic, they can never be broken. My parents have expectations and I do everything I can to meet them, even if it means giving up on my own dreams. ARC in exchange for an honest review. 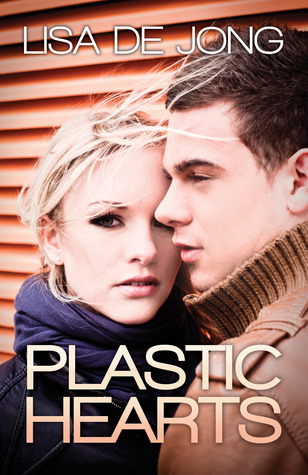 Plastic Hearts is a heartwarming story and it will put a smile on your face. The start of the story seemed a bit slow but once it got going I couldn’t put this book down. This is Lisa De Jong’s debut novel and one that will prove to be an entertaining read. Alex is the heroine that lives to please everyone else because that’s all she knows and it almost feels like it’s in her DNA to behave that way. But then the fabulous Dane comes in her life and turns her world upside down and I couldn’t be happier! While Alex and Dane come from two different worlds they really aren’t that different, both have emotional battle scars that run deep. I found myself invested in them and their story because I wanted them to survive their heartache. I wanted them to have their HEA. Wait until you meet Dane; you will fall head over heels for him but your heart will also break once you find out about his past! The situation with Dane’s brother lacked depth and it could have been explored a lot more because it was gritty and raw. While I only had a glimpse of that turmoil, I wanted more and ultimately it’s that issue that shapes Dane into who he is. Despite the slow start and an area where more depth was needed, I did enjoy this story. If you are in the mood for a book that will touch your heart and make you believe in love again, this is it!